Rare Polychrome Jasper 55mm-70mm spheres from Madagascar have a superb lustrous polish with a dazzling mix of hues, from burgundy and gold to muted green, brown and blue earth tones. Jasper is a mystical stone of justice, said to be highly protective and to rectify unjust circumstances. 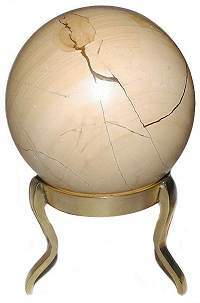 Jasper is an opaque form of Chalcedony and has been a stone for kings and shamans. The Oriental Rosewood Stand is sold separately. Beautiful shades of pink emerge from subtle ringed layers on these highly polished Pink Dolomite Jasper spheres from Mexico. This stone has a lovely smooth appearance that has a relaxing quality to it when viewed. Jasper is a mystical stone, said to stimulate creative visualization and increase global awareness. The Oriental Rosewood Stand is sold separately. 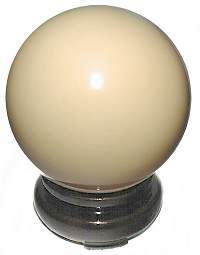 These subtle cream colored Dolomite Jasper Spheres are from Mexico. the best source is the facilitates and reinforces tranquility. In crystal lore Dolomite Jasper is considered to be an excellent worry stone that absorbs away cares and soothes the spirit. The Oriental Rosewood Stand is sold separately. 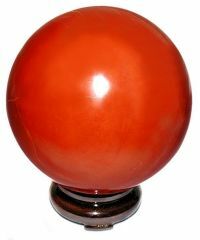 75mm or 3" Sphere - 1lbs 8ozs. These stunning deep brick Red Jasper spheres from Brazil have amazing even coloring with few variations and are beautifully hand carved and polished. Red Jasper is said to be a stone of justice and protection, assisting to rectify unjust circumstances. Red Jasper belongs to the quartz family known as Chalcedony. The Oriental Rosewood Stand is sold separately. 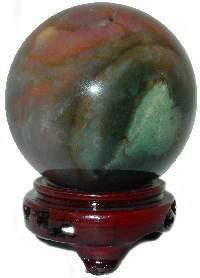 Spectacular Fancy Jasper spheres are bursting with fantastic colors and patterns that only Nature can conceive. Jasper is an opaque form of Chalcedony and has been a sacred stone for kings and shamans, believed to ward off negativity and give protection. The colors vary widely from light to dark shades. 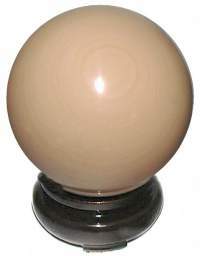 Beautifully polished 70mm or 2 3/4" gemstone sphere. The Oriental Rosewood Stand is sold separately. Fossil Jasper has an amazing variety of fossil shapes and patterns set against a smooth cream colored matrix. 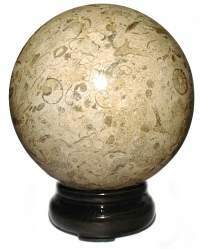 These stunning, large Pakistani Fossil Jasper spheres have a shiny flawless finish and add sophistication to any decor. Jasper is a mystical stone, said to stimulate creative visualization and increase global awareness. The Oriental Rosewood Stand is sold separately. 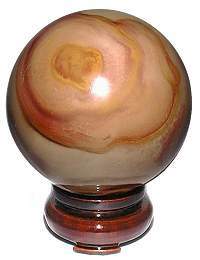 These stunning, very large Pakistani Picture Jasper spheres have a smooth polished beauty. They have the appearance of light polished wood (also known as Burma Teak) and adds sophistication to any decor. Large Brass Stand sold separately. 100mm or 4" Sphere - 3lbs 4ozs.